In 1982, R. Clark Mallam went to Lyons, Kansas for his yearlong sabbatical to do research on the serpent-like structure in the prairie near the town. Clark believed that the structure was an intaglio built by the prehistoric peoples who lived in the area. 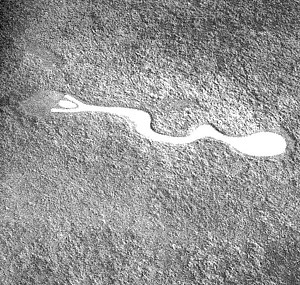 Aerial photograph of the limed serpent intaglio in Lyons, Kansas. Photograph by Walt Ellis, in "Site of the Serpent" by R. Clark Mallam (1990), pg. 33 . An intaglio, or reverse cameo, is an excavated form believed by some to be merely the initial stage in mound construction, the preparatory step in building a mound floor. Others considered them to be completed forms, special kinds of effigy mounds in which the builders constructed the form within the earth rather than upon it. Unfortunately, these enigmatic figures were never studied intensively. — R. Clark Mallam, "Site of the Serpent"
(1) The serpentine depression is a cultural feature; (2) it was constructed by prehistoric peoples; (3) it is aligned with the linear arrangement of the council circles; (4) It constitutes one aspect of the belief system of members of the prehistoric Great Bend culture. While excavating a section of the Serpent, Clark found two chert flakes (a flake is the debris from making or sharpening a stone tool) which suggests that prehistoric peoples did construct this feature. Art Bettis, a soil expert who helped on the project, found that the layers of different soil colors show systematic changes across the feature which is supportive evidence for the human modification of the area. However, Bettis did note that the differences were quite subtle and that more research would need to be done on the feature. 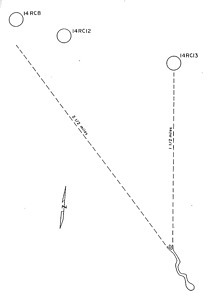 Clark also noted that the bluff ridge on which the serpent is located is large enough to accommodate its form in any direction. The prehistoric peoples chose to position it 20 degrees west of north. The serpent’s orientation connects to the nearby village sites, known as the Council Circles. Clark discovered that the “jaws” of the serpent included the three Council Circles in the outward extension of its alignment. On June 21st, the longest day of the year, the sun sits in the open mouth of the Serpent. The sun is a representation of life for the prehistoric Great Bend culture and thus the serpent holds life in its jaws. Clark believed that this intaglio served as a metaphor for life. This portion of the exhibit was completed by Cassie Kubicek ('13).